Since January 13 a plate fixed to the exterior wall of a school in Florence, Italy, testifies that the building is a “House of Life”. Beyond that wall, between the autumn of 1943 and the end of WWII, twelve Jewish girls from Poland, Belgium and France, found refuge, food and medicine, while outside the persecution of Jews was soaring. 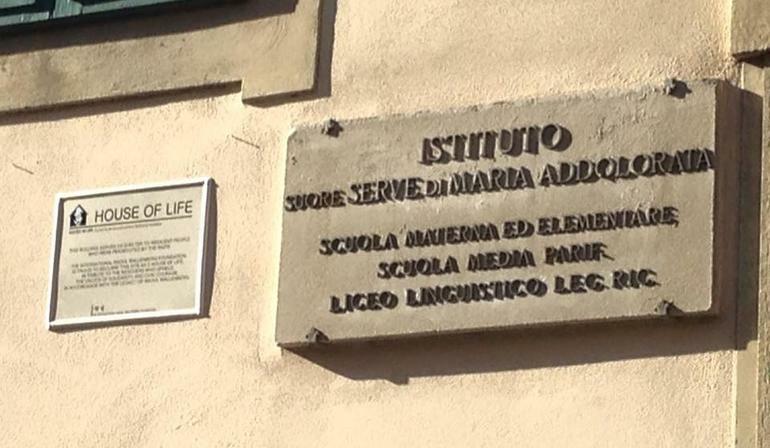 The superior of the religious community, Mother Maddalena Cei, opened the doors of the school and hide them, despite knowing that she, along with the girls, faced the risk of deportation to the extermination camp of Auschwitz. For this heroic gesture the Raoul Wallenberg Foundation, an educational NGO, organize a ceremony in the frame of its program “Houses of Life”, in order to show gratitude to the superior and to the school. The ceremony united secular and religious representatives of Tuscany as well as students, teachers and families of the region. In the darkest moments of World War II, Cardinal Elia Dalla Costa, archbishop of Florence, created a comitato (committee), which included, among others, Rabbi Nathan Cassuto. The role of this committee was to receive and hide Jews that were persecuted by the Nazis and its fascists allies. Thus, many Jews fleeing from other nations arrive in Florence looking for help. But a Nazi informer, member of the committee, told the Nazis about the operation and plans, causing the arrest of many Jews. Despite the setbacks, the convent and the boarding school of the Sisters Servants of Mary of Sorrows managed to provide shelter to the twelve Jewish girls. Until the end the girls led a quiet life and they received no pressure to convert to Christianity. After the war, their life paths separated. As there was a discretion on the identities, those facts were forgotten until the summer of 1995 when the convent received the visit of two women, the daughters of Sara Nissenbaum, as well as the sister of two other girls, Malvina and Renveni Gisella, who came to see the place where his family found refuge. In 1998, Odette y Michael Nissenbaum revisited “their” convent, the same year when Mother Maddalena Cei was recognized as “Righteous Among the Nations” by Yad Vashem. At the ceremony, attended by the head of Florence, Joseph Levi, Rabbi president of the Jewish Community of Florence, Sara Cividalli, Riccardo Pacifici, former president of the Jewish Community of Rome, Mother Paola Romoli, superior of the Congregation of the Sisters Servants of Mary of Sorrows, and the representative of Cardinal Giuseppe Betori, Archbishop of Florence, Don Bruno Simonetto. Local authorities attended the ceremony, among them Eugenio Giani, President of the region of Tuscany and Andrea Vannuncci, representative of the regional Council.